Cayucos is located in the Central Coast region of California. Prior to 1998, the coastal land adjacent to the site was privately owned, although public use of the property was common. The property was then purchased by the state, and in 2002, the area was converted to CA State Park land (Estero Bluffs State Park), further opening up access to the general public. This site is near the Morro Bay/Virg's Mussel Watch site. This gently sloping site consists of moderately uneven terrain, containing few cracks and folds. 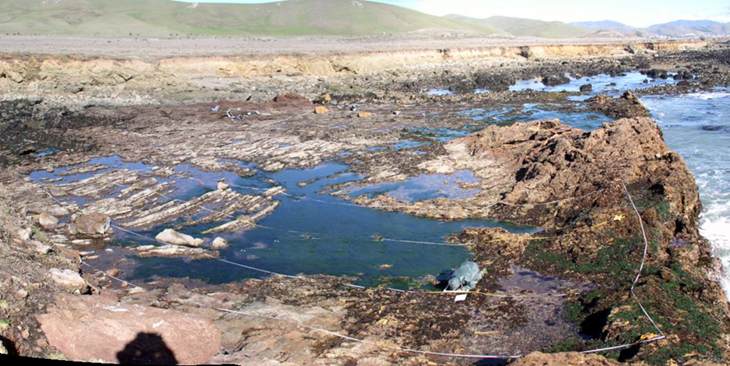 Cayucos is dominated by consolidated bedrock, and the area surrounding the site is comprised of a mixture of consolidated bedrock, and boulder fields. The primary coastal orientation of this site is southwest. 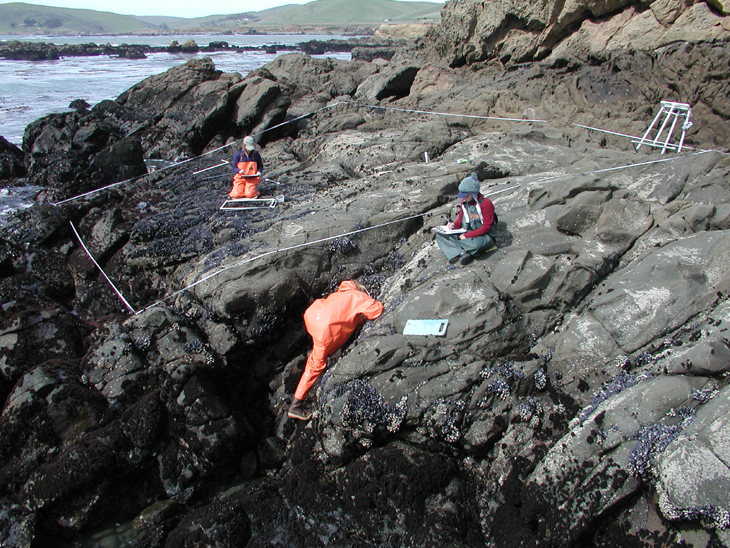 Long-Term Monitoring Surveys at Cayucos were established in 1995, and are done by University of California Santa Cruz. Long-Term MARINe surveys currently target the following species: Chthamalus/Balanus (Acorn Barnacles), Mytilus (California Mussel), Hesperophycus (Olive Rockweed), Silvetia (Golden Rockweed), Endocladia (Turfweed), Phyllospadix (Surfgrass), and Pisaster (Ochre Star). In addition, motile invertebrates, barnacle recruitment, mussel size structure, and water temperature are monitored at this site. Click here to view Long-Term trends at this site. Biodiversity Surveys were done by University of California Santa Cruz in 2001, 2008, and 2017. The Biodiversity Survey grid encompasses two sections that are approximately 9 meters (along shore) x 25 meters (seaward), and 18 meters (along shore) x 25 meters (seaward). Click here to view Biodiversity Survey findings at this site. For more information about Cayucos, please contact Pete Raimondi.